Right ventricular pacing by itself is considered suboptimal today, although several studies have shown that pacing from the high right ventricular septum or right ventricular outflow tract may be associated with better cardiac function compared to pacing within the right ventricular apex (8,35,36). However, this observation was not confirmed by other investigators (37,38). It appears that pacing in a position that results in the greatest reduction in QRS durations may be associated with the most beneficial clinical functional outcome (39). During right ventricular pacing, the posterior or posteroinferior base of the left ventricle is usually the latest activation site. Although left ventricular pacing is associated with better hemodynamics, the optimal pacing sites are yet to be determined. Yet, the PATH-CHF (Pacing Therapies for Congestive Heart Failure) study showed that the midlateral wall of the left ventricle may be the optimal site for biventricular pacing compared with other sites of the left ventricle (40,41). Flexibility in the placement of a coronary sinus lead in various locations of the left ventricle is a recent area of vigorous work. Currently, the lateral or posterolateral wall of the left ventricle is targeted for coronary sinus lead placement (41,42). A posterior or lateral branch of the coronary venous system is available on the retrograde coronary sinus venogram in a majority of patients. The clinical utility of pacing on the anterior left ventricular wall remains to be defined fully (43). A multielec-trode lead in the coronary sinus may minimize the importance of preselecting an optimal pacing site. One of the main mechanisms considered beneficial in biventricular pacing is the correction of an abnormal ventricular activation sequence. If multisite pacing is truly able to improve cardiac function by resynchronizing the ventricular activation sequence, there might be no better pacing site than His bundle pacing in the absence of intraventricular conduction block. Not surprising, His bundle pacing is considered to be associated with better cardiac function in a normal heart (Fig. 6). It is interesting to note that His bundle pacing may confer even better hemodynamic changes than those during sinus rhythm; the high output stimuli required for pacing the His bundle likely stimulate the sympathetic nerves across the atrio-ventricular groove, thus resulting in higher cardiac outputs. The potential benefits of His bundle pacing exist in the presence or absence of atrioventricular synchrony. Interventricular dyssynchrony is considered to contribute directly to impairment of cardiac function. Improved inter-ventricular synchrony provided by biventricular pacing is an important aspect of the overall efficacy of biventricular pacing. Because the location and degree of ventricular dyssyn-chrony will vary from patient to patient, it is more logical to provide an individualized synchronizing stimulation protocol to patients during cardiac resynchronization therapy. Compared with simultaneous cardiac resynchronization therapy, sequential cardiac resynchronization therapy is considered to improve left ventricular systolic and diastolic performance significantly (44). It has been reported that tissue Doppler imaging, with tissue tracking used to detect these segments with delayed longitudinal contractions, can be used to determine the optimum interventricular delay during cardiac resyn-chronization therapy (45). The current InSync III trial will examine the safety of sequential right and left ventricular pacing; the results of this study will be released in the near future. Consequences of atrioventricular asynchrony include the following: (1) diminished ventricular filling; (2) systolic mitral and tricuspid insufficiency; (3) diastolic mitral regurgitation caused by delayed valve closure; (4) pulmonary venous congestion secondary to atrial contraction against closed mitral valves; and (5) inappropriate decreases in peripheral resistance caused by atrial distension-induced autonomic activation. Therefore, optimizing atrioventricular synchrony is an important parameter that can greatly improve cardiac function, mainly because of enhanced ventricular filling and diminished systolic mitral and tricuspid regurgitation. In many clinical settings, this may contribute more to the observed hemodynamic improvement than correcting an intraventricular conduction defect. In the MIRACLE trial, all patients underwent atrioven-tricular optimization for enhanced diastolic filling. This was accomplished using a transmitral Doppler study approach in which atrioventricular delays were adjusted to extend the left ventricular diastolic filling times maximally without truncating the A waves (i.e., atrial kick). This approach emphasized the importance of atrioventricular optimization for ventricular filling, but drew attention away from the improvement of overall cardiac function elicited when employing cardiac resynchronization therapy. Other approaches used for atrioventricular optimization and programming have included assessment of cardiac outputs, degrees of mitral regurgitation, aortic flows, and pulse pressures. It should be noted that the definition and choice of standardized techniques for adequately assessing atrioventricular optimization remain to be fully investigated. 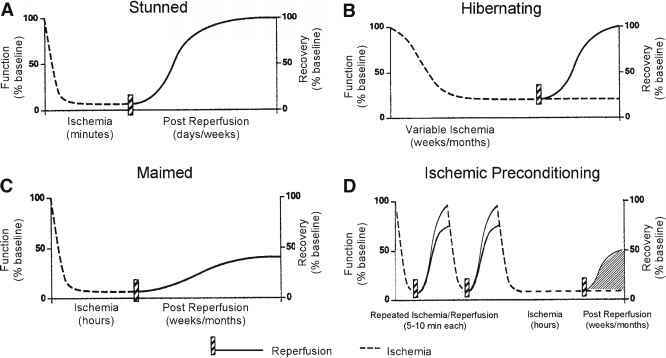 Animal studies have indicated that nonexcitatory stimulation improves left ventricular function and is superior to biventricular pacing for improving function in an animal model with left bundle branch block without affecting transmittal valve flow and subsequently left ventricular diastolic function (46, 47). Further, the role of paired stimulation based on the post-extrasystolic potentiation effect to augment ventricular function in the failing ventricle is inconclusive (48,49). Sympathetic activity is increased in patients with congestive heart failure, as evidenced by elevated levels of circulating norepinephrine and increases in adrenergic nerve outflow. The initially enhanced sympathetic responses to congestive heart failure are likely to play a compensatory role early during the disease process. However, chronic adrenergic activation is known to be associated with a vicious cycle that promotes progression of disease through multiple effects, including: (1) increased afterload, (2) exertion of direct toxic effects on the failing myocardium, (3) increased myocardial oxygen demands, and (4) triggered ventricular arrhythmias. Elevated plasma norepinephrine levels have been shown to correlate with cardiac mortality rates and are considered to be better prognostic predictors than ejection fractions. To date, p-blocker therapy has been accepted as a standard treatment for moderate congestive heart failure. In contrast, left ventricular-based pacing has been shown to clinically improve hemodynamics and decrease sympathetic nerve activity compared with right ventricular pacing in patients with more severe left ventricular dysfunctions regardless of their QRS durations (50). Biventricular pacing has been described also to result in a decrease in sympathetic nerve activity associated with improved hemodynamics compared with intrinsic conduction in patients with left ventricular dysfunction and intraventricular conduction delay (51). In addition, chronic biventricular pacing may even decrease serum norepinephrine levels in patients with dilated heart failure, with the greatest sympathetic activation at baseline (52). The evidence of decreased intrinsic heart rates following long-term biventricular pacing may further suggest that biventricular pacing improves contractility without increasing sympathetic activity (18). These combined observations may suggest that chronic biventricular pacing will likely reduce mortality. Fig. 7. Medtronic biventricular pacemaker (InSync model 8040) and the Y-adaptor in the header. 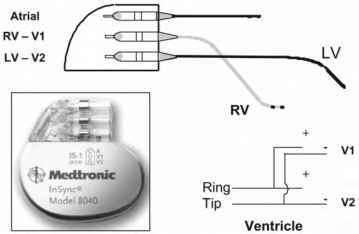 Most commercially available left ventricular (LV) leads are unipolar with a shared common ring of a bipolar sensing/pacing right ventricular (RV) lead. biventricular pacing has been shown to increase the energy cost significantly. Hence, biventricular pacing may provide a more efficient way to treat patients with congestive heart failure with intraventricular conduction delay.